HA NOI (VNS) — All eyes will be on the crucial match between Dong Nai and Hoang Anh Gia Lai (HAGL) in the 23rd round of the Toyota V.League today. The match is a six-pointer for both teams as they battle to avoid relegation. Dong Nai and HAGL are currently propping up the table with 17 points after 22 matches. Dong Nai players have extra incentive, with a bonus of VND1 billion (US$45,500) available should they win. HAGL aren't offering a bonus due to fears it may distract their players. "Most of our players are young so we don't want a bonus distracting them. HAGL has always treated players well so I don't think prize money is an issue for us," said HAGL's chief representative Nguyen Tan Anh. The Dong Nai managing director Nguyen Van Long said "This match is very important. We need to win to stay in the national premier league. We raised this bonus to boost our players' spirit". 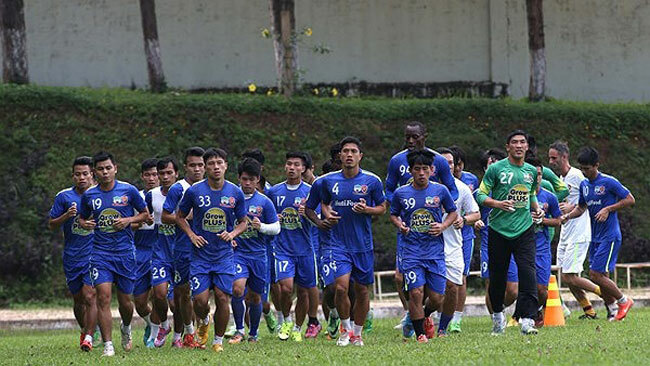 The match will be played at Bien Hoa Stadium in the southern province of Dong Nai. According to Long, security for the match will be stepped up. "We have about 400 people as security for this match. We hope the game will run smoothly without any incidents. We are determined to win this decisive game," said Long. The match will be refereed by Malaysian Abdul Wahab. Dong Nai clearly see this as vital game as they rested several key players against Binh Duong in the 22nd round on Sunday in preparation for the HAGL fixture. "Players who had received two yellow cards didn't play against Binh Duong because I was worried they would miss the match with HAGL if they got another yellow card," said Dong Nai coach Tran Binh Su. Su believes with the support of the fans on their hometurf Dong Nai will triumph. Notably, HAGL have never beat Dong Nai at Bien Hoa Stadium. HAGL's striker Nguyen Cong Phuong misses the match through suspension after picking up three yellow cards. The Nghe An province-born Phuong scored six of HAGL's 27 goals this season. Newly appointed coach Nguyen Quoc Tuan dismissed concerns over Phuong's absence. He said other players can play in the striker's position. In the title race Becamex Binh Duong, who top the table with 45 points, will meet the second placed FLC Thanh Hoa, who have 43 points, at Go Dau Stadium in the southern province of Binh Duong. The match is expected to draw nationwide attention as a Binh Duong victory will all but clinch the title. In other fixtures, Ha Noi T&T will meet Khanh Hoa at Hang Day Stadium, Quang Nam face Hai Phong at Tam Ky Stadium, Quang Ninh Coal play Dong Tam Long An at Cam Pha Stadium.